After receiving a review unit from Apple on Tuesday, The Verge did some initial benchmark tests with the refreshed hardware. They found that the Intel Core m5 model, clocked at 1.2 gigahertz, came in about 20 percent faster than last year's model in a Geekbench 3 test. Disk write speeds measured with Blackmagic showed that the new SSD in the early 2016 MacBook is 80 to 90 percent faster than its predecessor. Reading speeds were defined as "smaller, incremental improvements." Of course, more extensive benchmark comparisons will tell the full picture over the coming days and weeks. But the early sampling suggests performance will be in line with what Apple's marketing claims. While Apple made no statements about the raw processing power of the new MacBook, the company did say its integrated Intel HD Graphics 515 offers up to 25 percent faster performance. A new, faster PCIe-based flash storage module was also highlighted by Apple, but without any claims about performance. 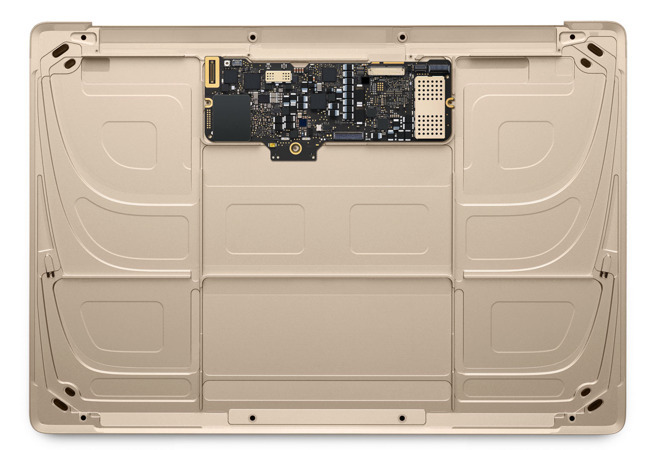 The 12-inch MacBook has also been upgraded with faster 1866-megahertz memory, and battery life has been improved by an hour, now estimated at up to 10 hours of runtime. For those looking to squeeze a little more speed out of the MacBook, Apple offers a 1.3-gigahertz Intel dual-core m7 upgrade. It's $150 extra for the 512-gigabyte model, and a $250 increase over the entry-level 256-gigabyte version with 1.1-gigahertz m3 processor. All models come with 8 gigabytes of RAM and Intel HD Graphics 515. The new MacBooks are now available to purchase direct from Apple, and will be sold through Apple Authorized Resellers and Apple's own retail stores beginning Wednesday.